This entry was posted on December 15, 2014 at 12:14 am and is filed under Kids, pictures, Statistics, Travel, University life with tags ABC, Andrey Markov, Canada, compiler, Montréal, mug, NIPS 2014, phylogenetic tree, population genetics, probabilistic programming, random forests, variational Bayes methods. You can follow any responses to this entry through the RSS 2.0 feed. You can leave a response, or trackback from your own site. One of the things I like most is the security queue in the airport the day after NIPS, had great talks with Kevin Murphy, Dieter Fox and also saw several others by the gate. Really enjoyed having you at NIPS, with luck you’ll be back soon. Interesting to see all your thoughts, and was really pleased to see the gap between probabilistic programming and ABC start to close! This was the (only) drawback with the frequent flier security queue, there was no one to talk with!!! 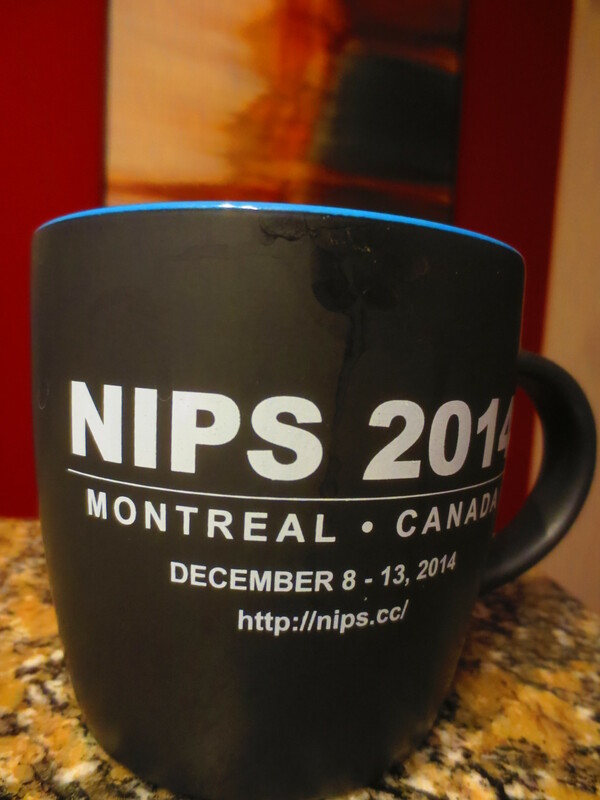 I will certainly attempt another NIPS, even without the skiing incentive! A few more talks and I’ll be 100% clear about PP=ABC! Perfect trip back, from a nice chat with Max Welling in the Montréal lounge to a seat on the upper deck where I could sleep with flat legs on the side drawers. And hardly any delay…until I boarded the train downtown that got stuck for so long that I was 10mn late for my last class. Had to skip improper priors completely! Which will not sadden some of my readers..!